Just what lay behind the New York DA’s aggressive targeting of a small Chinatown bank in the wake of the 2008 financial crisis? Abacus Federal Savings, a family-run community institution, became the sole bank in America indicted for practices that brought the mortgage industry—and the economy—to its knees. The giant culprits were deemed too big to fail. But Abacus was seen as just right: small enough to jail. Or so it seemed. Alumnae Vera and Chanterelle Sung relive their family’s saga. Fifteen Chinese-Americans were handcuffed, chained together, and paraded by law enforcement down the narrow hallway of a New York City courthouse. Cameras flashed as they held on to each other, hunched over, trying to cover their faces. The date was May 31, 2012. Vera Sung ’90 and Chanterelle Sung ’04. 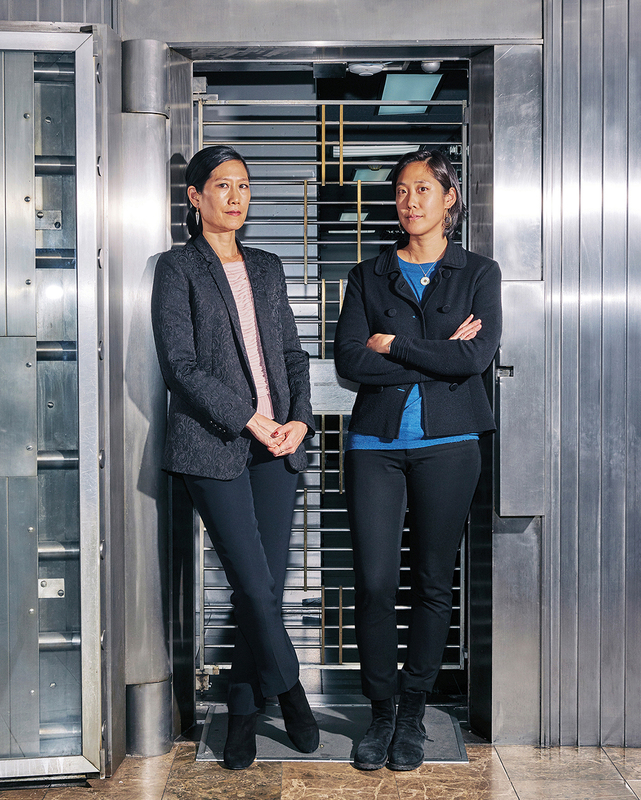 Abacus, which was founded by the father of Vera Sung ’90 and Chanterelle Sung ’04, was, and remains, the only bank indicted in the wake of the 2008 financial crisis. 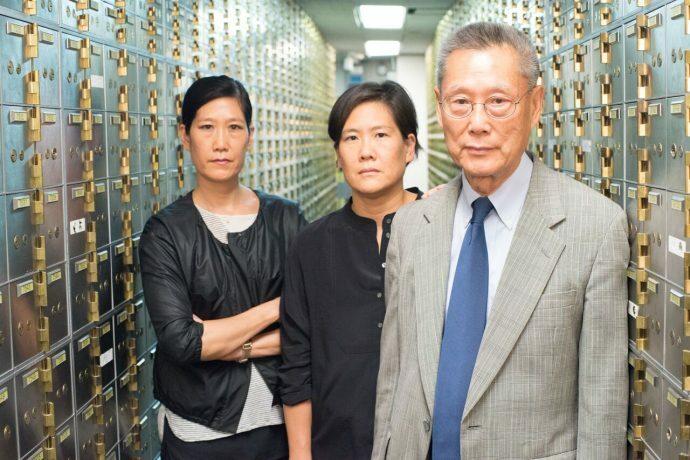 The case is the subject of the PBS documentary Abacus: Small Enough to Jail that has been nominated for an Acacemy Award. More than that, the story of Abacus and the Manhattan DA’s office is a cautionary tale of what can happen when a culturally distinct community of immigrants seeks to share in the American dream, and a zealous prosecutor’s office concludes that its efforts to do so are criminal. In the dizzy years before the great depression of 2008, lenders were pumping up a speculative housing bubble and getting very, very rich by predatorily throwing mortgages at homebuyers with poor credit ratings. These subprime mortgages were pooled together into securities and sold as investments. Lured by the rising values of their rapidly appreciating homes, homeowners went on a consumer spending spree. The US economy was booming. Few people questioned whether any of this was wise. A notable exception was the founder and chairman of Abacus Bank, Thomas Sung. Thomas could have jumped on the bandwagon. In 2006, a broker from Chicago had tried to sell him highly rated mortgage-backed securities boasting a 12 percent yield. Thomas requested more information. Days later, a large binder reached his desk, filled with pages of impenetrable fine print. In a follow-up conversation, Thomas asked the broker what happens if the loans behind the securities defaulted. Oh, not to worry, he was told. There hasn’t been a default in seven years. And that was that. Abacus never invested in mortgage-backed securities, nor did it ever originate any subprime mortgages. When the housing bubble burst, the world tumbled into financial crisis. Millions lost their homes, their savings, their livelihoods. But Thomas Sung’s hands were clean. Abacus continued about its business. Then, something happened. In December of 2009, Thomas’ daughter Vera, a member of the bank’s board of directors, and her sister Jill, the bank’s president and CEO, discovered that, in an otherwise routine home mortgage closing, a low-level employee was embezzling funds. They stopped the closing. They fired the employee. They reported the incident to the bank’s compliance officer. They hired an outside consultant to investigate, which resulted in more firings and several resignations. They notified their mortgage financer Fannie Mae. And they advised the borrowers to report the matter to the police. The founder and chairman of Abacus Bank, Thomas Sung. “This was exemplary conduct,” says BC Law Professor Patricia McCoy, an expert in banking and banking regulation. 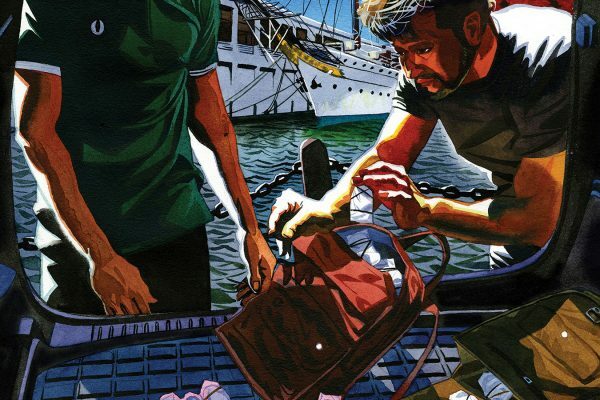 “Any bank has a risk that a rogue employee or two will engage in fraud.” Getting to the bottom of why the fraud happened and preventing it in the future was a job for the bank regulators. But Manhattan DA Vance didn’t see it that way. His office started investigating. Abacus officials fully cooperated, ultimately handing over to the DA more than 600,000 pages of neatly organized documents. But as the DA’s questioning grew increasingly hostile, it dawned on the Sungs: They aren’t just investigating this small matter. They are investigating us. To Thomas, Abacus was more than just a bank. It was a community service. Born in Shanghai, Thomas was sixteen when he immigrated to America with his mother and father in 1951. Hardship struck when his mother passed away. Thomas pursued his education while helping the family and holding down a job, eventually graduating from Brooklyn Law School. 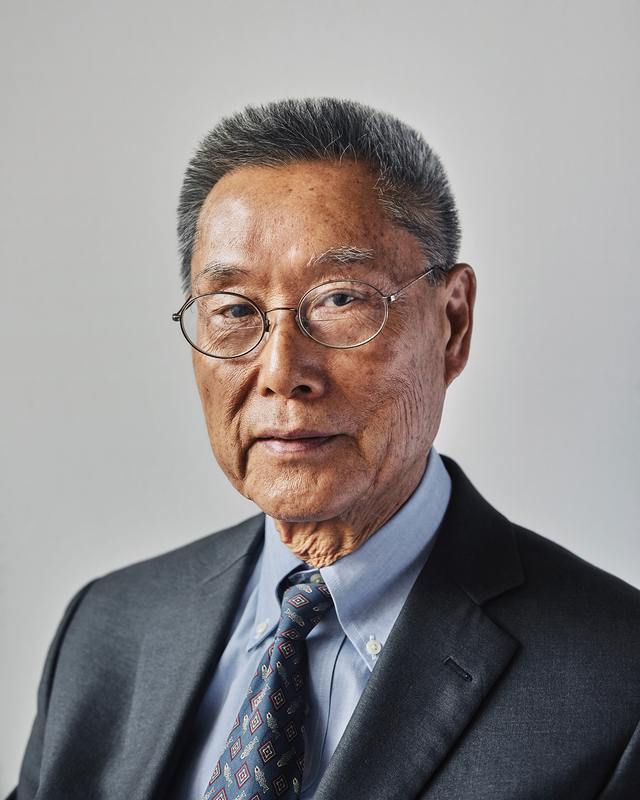 He met and married Hwei Lin Tseng in the early 1960s, became a leader in Chinatown’s community associations, and ran his own law firm while Hwei Lin stayed home with their four daughters, Vera, Jill, Heather, and Chanterelle. He helped his clients obtain citizenship, open businesses, buy homes. He noticed that, while the “mainstream” banks were happy to accept deposits from their Chinese patrons, they were less enthusiastic about lending them money. 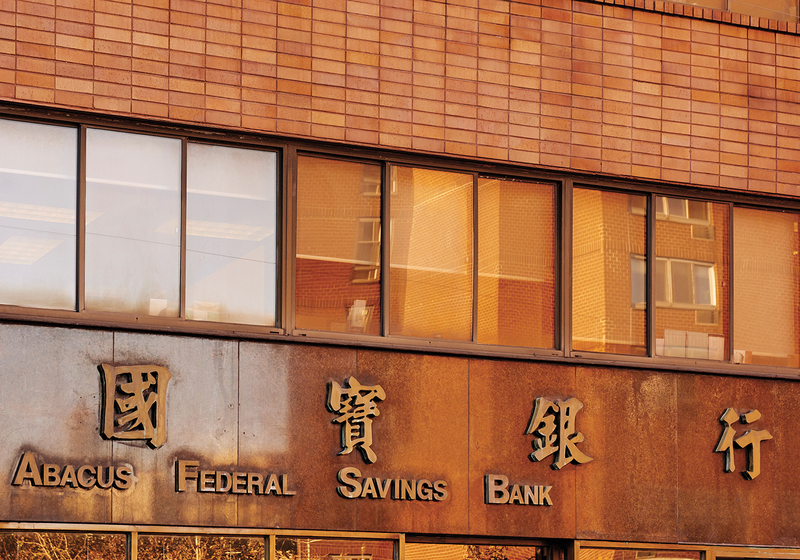 Abacus Bank was born of Thomas’ insight that if the people of Chinatown were going to partake of the American dream, they were going to need capital. 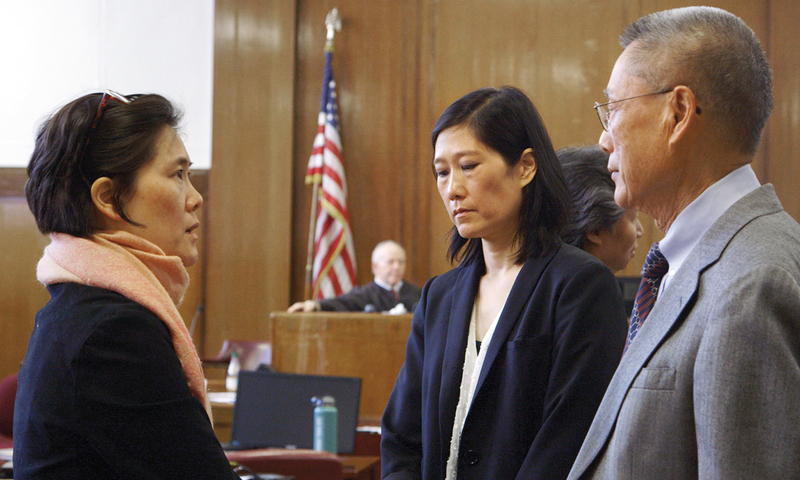 After a three-month trial, from left, Jill, Vera, and Thomas Sung await the verdict in the State Supreme Court in Manhattan. The Sungs’ realization that the DA’s office was turning on them came with an added jolt: Chanterelle was an assistant DA working in the very same division that was investigating the bank. “I had always wanted to work in the public service and that’s something I did for eleven years after graduating from law school,” Chanterelle says. Seven of those years she spent with the Manhattan DA. Chanterelle’s earliest memory of doing public service was when she was a young schoolgirl and volunteered for the Red Cross. “My mother wanted to make sure that I was using my time wisely, that I wasn’t going to be just wasting my summer away. She always said you have to be doing something good,” she added. “My family was very respectful of the fact that I actually had a great career at the DA’s office and enjoyed it tremendously,” Chanterelle says. 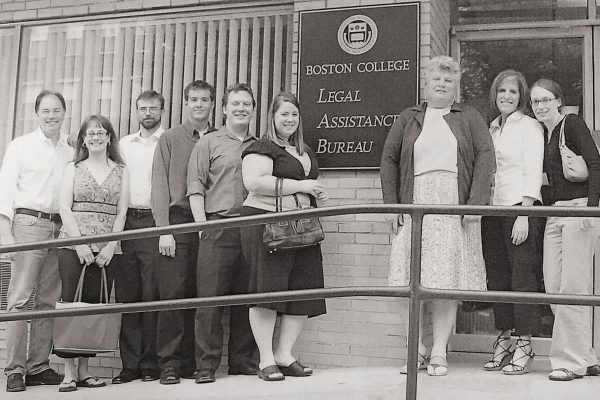 “They kept me firewalled from what was going on in terms of the case against our bank. The office requested that as well so that there wouldn’t be a conflict of interest.” But Chanterelle ultimately left the job she loved to be with her family in the fight of their lives. “I wanted to be able to know everything that was going on and I really didn’t have that ability by staying in the office,” she says. During the period covered in the indictment—2005 through 2010—the bank’s loan-default rate was less than half a percent. That’s extraordinarily low—the national average was more than 5 percent. Fannie Mae, the alleged victim, had profited by more than $100 million from loans originated by Abacus. Abacus was the 2,651st largest bank in the US, with just $300 million in assets, and had never trafficked in the questionable mortgages that had brought down the US and world economies. In contrast, the too-big-to-fail institutions like Morgan Stanley, Goldman Sachs, JP Morgan, Chase, and Citicorp had issued $4.8 trillion in fraudulent mortgages and had received a $700 billion government bailout, paid $110 billion in fines, and were given deferred prosecution and non-prosecution agreements. The only offer Abacus got was to plead guilty to a felony and pay a $6 million fine. That disparate treatment “was something that was so upsetting for us,” says Chanterelle. Vera and Chanterelle’s mother, Hwei Lin. Pleading guilty would have meant the end of the bank. The Sungs decided to fight. “What choice did we have?” Vera says. The trial opened on February 23, 2015. In the end, the jury would have to choose between two opposing stories. In the prosecution’s story, Abacus and its employees had criminally conspired to defraud Fannie Mae. The Sungs’ team of lawyers argued that there was no fraud, as evidenced by the fact that Fannie Mae had suffered no losses or harm. Behind the scenes, the Sungs met frequently, patching one another in as necessary by conference call, to debrief about the trial and take comfort in one another. Thomas was the calm, steady fighter, strategic attorney, and savvy public relations manager. Chanterelle and Vera, his lawyer daughters, joined him in these tasks. Jill was a strong, effective compartmentalizer, running the bank and watching the trial while keeping at bay her fear that the DA’s office would have her arrested in front of her children. (This never happened). Daughter Heather, a palliative care physician, was a soothing presence in family discussions. Hwei Lin, their mother, was the worrier for them all. 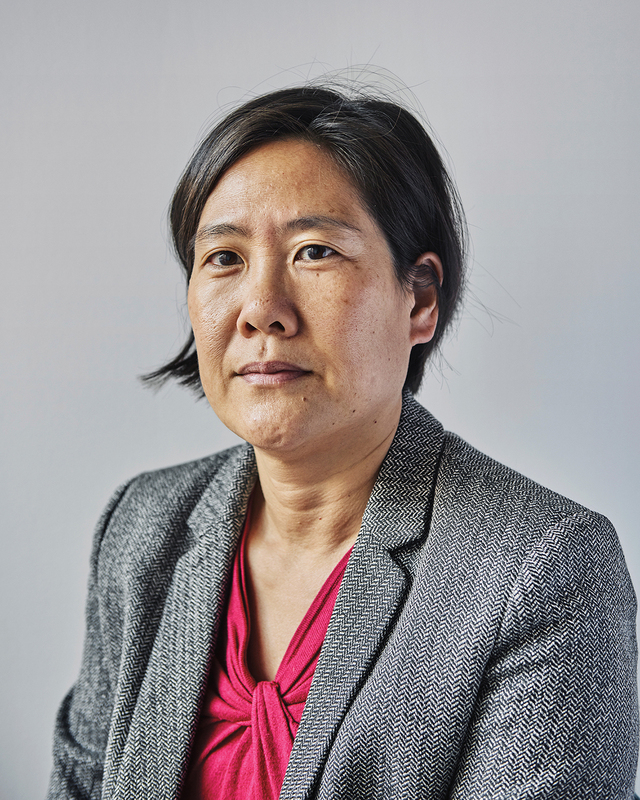 But she found her much-needed cause for hope in the presiding judge, Roger Hayes, who reminded her of her beloved grandfather, Tseng Sao Suen. Her grandfather had been a justice on Taiwan’s highest court. Hwei Lin had taught her daughters that even though he was very poor, he was known as an honorable man who had served his community with integrity. Vera and Chanterelle’s sister, Jill. Thomas and Hwei Lin were conscientious mentors to their children. “Our parents spent so much time with us,” says Chanterelle. Chanterelle swam competitively in high school, and her mother drove her to and from swim practice every day. She loved this time alone with her mother. 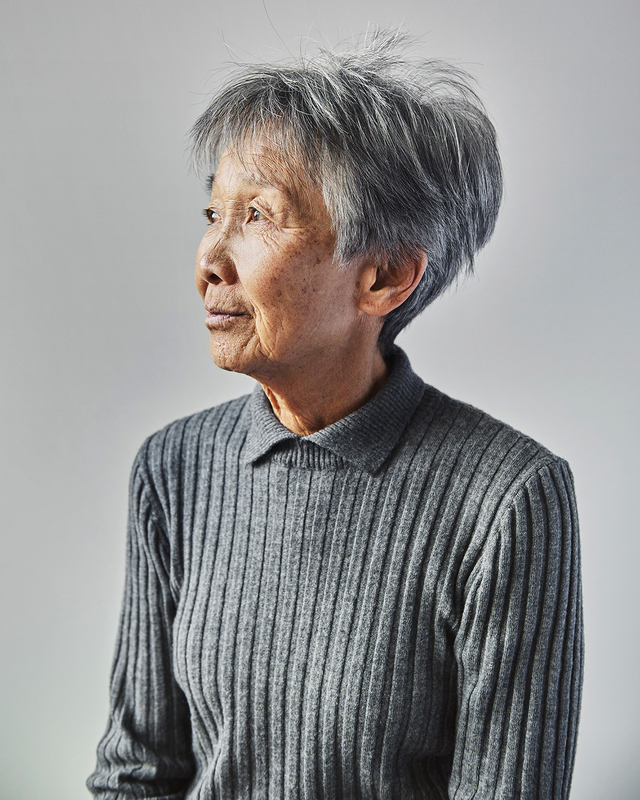 Vera admits that “I would have loved to be hanging out at the mall with my friends, but our parents were very strict,” then quickly adds that her parents were not at all like the “Tiger Mother” stereotype. “It was more like, do the best you can, but be good,” she says. Vera helped her father in his law office, and accompanied him when he visited his properties. He also taught her how to use a hammer, a screwdriver, a drill. How to mix cement. He taught her how to write a check, and eventually, how to do closings, which she does to this day at his law firm Sung & Co., PC, where she is an associate. When illness struck a neighbor, or a stray cat needed a home, Hwei Lin would always help. “That is my mother,” Vera says. Weekends were for chores, with both parents and all four children chipping in. There were no nannies, no maids. And for the Sungs, the trial was hard indeed. The adversarial system demanded that borrowers testify against bank employees, that employees testify against their supervisors, and that lawyers catch all of them in lies. Thomas worried that the reputation of the Chinese-American community was being sullied. 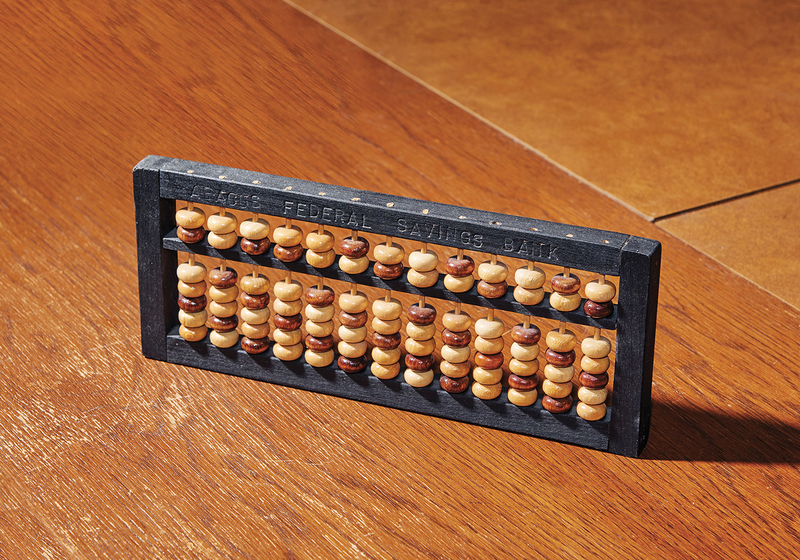 An abacus from the bank’s collection. The bank’s employees who had been indicted were either acquitted or had the charges against them dropped. The trial had kept an employee from attending his mother’s funeral in Hong Kong, and he was so traumatized by the ordeal that he can no longer bring himself to sign a check. Defending the bank cost the Sungs $10 million in legal fees, and likely another $10 million in lost business. The Sungs are healing from their ordeal, and drawing strength from the voice that the documentary has given them. Vera, Chanterelle, and Jill speak around the country, raising awareness about prosecutorial overreach and the plight of underbanked cultural communities in America. Abacus is now turning a profit and has resumed making loans.